If secret agent James Bond wanted to tell his MI6 superiors about the location of a stolen superweapon without tipping off villains, he might turn to a global satellite network that transmitted coded keys made unbreakable by the weird laws of physics. Such "quantum key distribution" already exists on Earth beyond the realm of Hollywood spy fantasies, and could soon head for space. Plans to launch quantum communication satellites have already begun to take shape in Canada, Japan and the European Union. The satellites could securely transmit digital keys through light particles by using physics tricks such as quantum entanglement — the phenomenon that allows two entangled particles to affect one another other even across the distance of a galaxy. "If we can build these quantum key distribution systems and make them global, we will be able to transfer information in such a way that if there's a hacker who tries to find this information, we will know," said Raymond LaFlamme, director of the Institute for Quantum Computing at the University of Waterloo in Ontario. "Then we will be able to find a better way to encrypt that bit of information." The European Space Agency has even pushed for a "QUEST" space experiment that would test quantum communication to and from the International Space Station. Researchers discussed such ideas during the annual meeting of the American Association for the Advancement of Science in Vancouver on Feb. 19. There are two ways to securely transmit a quantum key. The first method — pioneered by Artur Ekert in 1991 — encodes bits of information within entangled pairs of light particles (photons) that are shared among two ground stations. When the stations measure the unknown state of each entangled photon, they usually expect to get the same random answer as the other station. If a hacker intercepts a photon that forms part of the quantum key, the action interferes with expected matching states of the entangled photons and leads to detectable errors. The ground stations would not only recognize the hacking attempt, but could also still create a secure key by throwing out any errors. The European Space-QUEST experiment would test quantum communications to and from the International Space Station. "You use the satellite to establish the secret key until both ground stations get the key which they can use at any time they want," said Anton Zeilinger, a physicist at the University of Vienna in Austria. "The satellite has to be assumed to be secure between the two passes over the two stations." A second quantum key method was created by Charles H. Bennett and Gilles Brassard in 1984. Ground station "Alice" can send a key of random numbers based on light pulses containing photons in one of two different states. Ground station "Bob" does not know the state of each photon, but simply measures all incoming photons based on one state so that it is correct about 50 percent of the time. Bob can publicly tell Alice what basis it used to measure each photon — without actually sharing each measurement — and Alice can say whether Bob was correct or not. That allows the two stations to agree upon a random key based on the measurements that Bob got right. Whenever a hacker tries to intercept and guesses the wrong state for the photon, the interference changes the photon's state and lead to errors in Bob's measurements. If Alice and Bob find a higher percentage of errors than expected during random sample checks, they throw away the compromised key and try again. Some security companies already offer this second method of quantum key distribution. But today's quantum keys only travel across fiber optic networks similar to those that transmit Internet or TV signals — a method limited to about 100 kilometers (62 miles) before the photons get absorbed. Researchers want to take the next step by beaming the quantum keys between stations and satellites with lasers. An illustration of the quantum communication experiment showing the Matera Laser Ranging Observatory telescope and Japan's Ajisai laser-ranging satellite. A European test has already proved that photons can remain entangled across a distance of almost 90 miles (144 km). 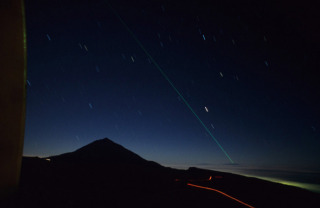 Researchers entangled a pair of photons on the Canary Island of Tenerife in the Atlantic Ocean and beamed one of the entangled photons to a receiver station on the neighboring island of La Palma in September 2005. Another experiment in 2008 showed how a telescope could detect photons reflected back from a Japanese satellite. That did not use entangled photons, but it did show how the idea of a satellite network could work in principle. The Canadian Space Agency is working on plans for its Quantum Encryption and Science Satellite, while the European Union has teamed up with China's Academy of Sciences for an intercontinental quantum key distribution test. The European Union also continues to work on using the space station to transfer a quantum key between ground stations separated by 870 miles (1,400 km). Meanwhile, Japan has been running its own Earth-based quantum key distribution network in Tokyo. The country could launch an experimental satellite in four or five years, said Masahide Sasaki, director of the National institute of Information and Communications Technology in Tokyo. The U.S. has seemed strangely absent from the quantum communications discussion, researchers agreed. But meeting attendees suspected that had more to do with such projects being sponsored by the National Security Agency — an organization that may like secrets even more than quantum communications researchers. This story was provided by InnovationNewsDaily, a sister site to SPACE.com. You can follow InnovationNewsDaily Senior Writer Jeremy Hsu on Twitter @ScienceHsu. Follow InnovationNewsDaily on Twitter @News_Innovation, or on Facebook.